(Bloomberg) -- Delays in the sale of assets under India’s bankruptcy law are becoming a key challenge for bidders who “cannot wait indefinitely” because of funding constraints, according to JSW Steel Ltd. The Sajjan Jindal-run mill, which has bid for many companies under the insolvency law since sales of distressed firms began in 2017, is among bidders who have faced repeated delays in their attempts to buy indebted assets. A bidder has to tie up the capital for investing in an asset when submitting a resolution plan and “it is not possible for any company, big or small, to keep the funding ready forever,” said Seshagiri Rao, joint managing director of the steel mill. Since the Insolvency and Bankruptcy Code was passed in the Indian parliament in 2016, the resolution process has been slowed as courts are inundated with appeals from founders, administrators, lenders and bidders. Lenders to the first 12 companies brought to the insolvency court have lost out on 40 billion rupees ($580 million) in additional income due to delays in the resolution process beyond the time mandated by law, according to rating company ICRA. Almost 68 percent of cases under the insolvency process had exceeded the 270-day deadline allowed as of Dec. 31, with some of the cases going beyond 500 days, ICRA said in a January report. JSW took over Monnet Ispat & Energy Ltd. in July after multiple company law tribunal hearings despite being the only bidder for the asset. It has also emerged as the sole bidder for another stressed steel products maker Asian Colour Coated Ispat Ltd., but the lenders and the professional in charge of the sale process have reportedly sought an extension of the deadline for submission of bids. The mill has also been selected as the preferred bidder for Bhushan Power & Steel Ltd. and is awaiting the final nod from the tribunal. JSW had expressed interest in buying Bhushan Steel Ltd. and Usha Martin Ltd., both of which were snapped up by Tata Steel Ltd. It also belatedly attempted to enter the race for Essar Steel India Ltd., when a second round of bids were called. 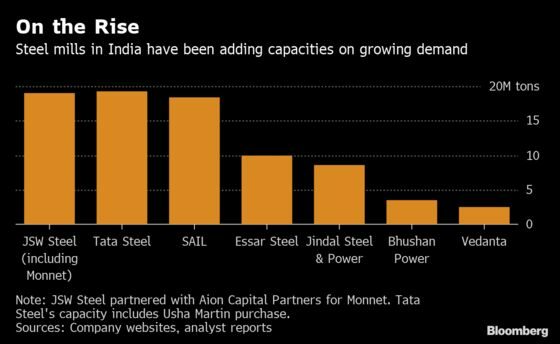 India’s insolvency process is reshaping its steel industry. Five companies from the sector were among the 12 large debtors -- the so-called dirty dozen -- ordered into bankruptcy court in 2017. Tata Steel’s bet on snapping up the assets of bankrupt mill Bhushan Steel has paid off as it overtook JSW as India’s biggest producer last year. ArcelorMittal is inching closer to opening shop in the South Asian nation as its offer to buy Essar Steel was approved after months of court battles. Economic growth is driving steel demand and pushing producers to scale up capacity. India’s steel demand is forecast to grow 7 percent to 7.5 percent this year, Rao said, driven by government expenditure on metro stations, water pipelines, bridges and affordable housing. JSW expects to expand crude steel capacity to 24 million tons by March 2020 from 18 million tons now, and value-added capacity by 80 percent to 9 million tons, he said, adding that “we are in the market to raise money” to complete all these projects. JSW is raising $500 million through five-year overseas bonds to expand capacity. The company is tapping global markets as long tenure instruments in the Indian market are difficult unless the bond market matures, Rao said. “It is a forced option,” he said. As JSW continues to expand capacity, the company will keep tapping global markets either through external commercial borrowing, export credit agencies or bonds to meet fund requirements in future, he said.